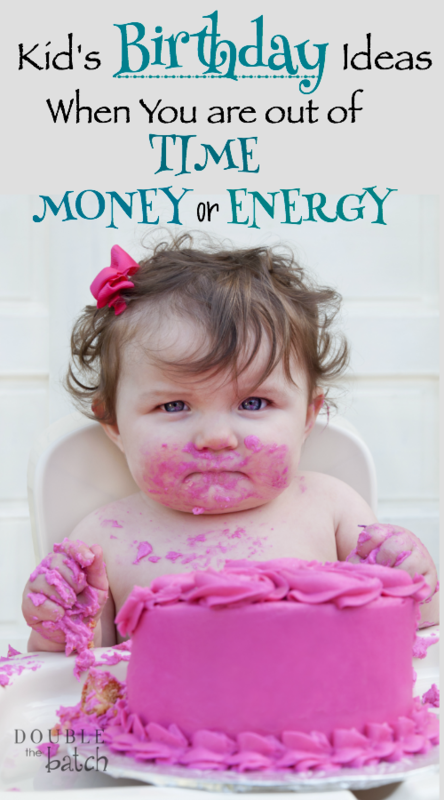 Is one of your kid’s birthdays coming up and you find yourself out of time, money, or energy? I hear you, sister. Don’t worry. I’ve got a plan. Read on. As much as I love my children, the honest truth is I usually phone in their birthday parties at the last minute. My sister excels at birthday parties and loves planning and creating them down to the tiniest detail. I once had to take a nap after just watching her host one of these parties. I appreciate those who do can do this, and if you are one of those people, please– do not lower your standards by reading my post. But, I’m hoping I am not alone and maybe there are some other mothers out there who, like me, are looking for an easier way to do birthdays. So, I give you my list of ideas to take this whole birthday craze down a notch when you are just not feeling up to the task. Some will save you money, some will save you time and energy, and some will do all three. But, they are all stress-reduced ways to ensure you are still a birthday hero in your child’s eyes. 1- Let your CHILD (not you- because that, of course, would take time and energy) plan a date night for just you, your spouse if you are married, and them. Kids LOVE having one-on-one fun time with their parents where they have your undivided attention. Let them choose a restaurant to eat at and an activity to do together. Kids don’t generally have expensive tastes in restaurants, so it shouldn’t make a huge dent in your wallet. Spend the night talking with them about your favorite memories of them growing up. They LOVE to hear what they were like when they were little, and it will make them feel very special and loved. 2- Let your child pick two or three friends who they can take on a birthday outing, which you can cater to your budget and your child’s age. Some ideas might be: pizza and a movie at your local discount theater, dinner at a fast food restaurant with a play land, dinner and a play or sporting event, a trip to the local fun center in your area, a day at the local water park for summer birthdays, a trip to the local children’s museum, bowling alley, trampoline park, mini-golf course, etc. Let the professionals entertain your kids while you merely supervise, which shouldn’t be too difficult with just a few kids. 3- Go on a little one-night, stay-cation as a family in honor of your child’s birthday- or if they are close together, it becomes even more economical if you make it a celebration of multiple birthdays. We did this for my daughter”s birthday, which was two weeks after I had my last baby. A friend told me about a sweet hotel in the area that had a mini-water park and arcade inside of it. We booked a room and the kids had a great time. Instead of a cake, we went and got her favorite doughnuts. I hung out in the room with my newborn, while my husband swam with the kids. Most kids are just thrilled to stay at a hotel with a pool. Find something fun in your area and sell the idea to your kids. This may or may not save you money, but it will save you time and energy. 5- Have a girls’ night out with your daughter and her sisters or a close friend or cousin. Or, have your husband take your son and his brothers or a close friend or cousin on a boys’ night out. Let the birthday kid design the plan for the night… within reason, and your budget, of course. 6- If your child is too young to read a calender, just let the day pass without them knowing… Just kidding. That is totally not a viable option. Let’s just stick with the first 5. Pretend I never suggested that. I mean, what kind of parent would ever suggest something like that? Seriously, I’m lazy, but I’m not THAT lazy. Really, though, don’t do it. Birthdays are a big deal. You could land your kid in therapy with a stunt like that. The key to most of these options is they eliminate the time, money, and energy you would spend on an elaborate cake, gift bags, food, and decorations. Instead, use that money to pay for dinner or an activity. And taking the number of attendees down to 2 or 3 from 20 should drop your stress level considerably. There you have it. Now, go be your kid’s birthday hero and don’t feel guilty about not putting on the party that all the other mom’s are putting on. As long as your kid feels loved and enjoys the day, you’ve done your job. And if you can do it without an inordinate amount of stress and money, all the better, I say.